Installed Firefox 60.1.0 ESR. Open any website (www.google.com). "pref("security.enterprise_roots.enabled", true);" is set in the mozilla.cfg file. I create a new GPO and enroll the necessary certificate in the "Trusted Root Certification Authority"
The message "the connection is not secure" appears - because of the missing certificate. The necessary certificate will be enroll automatically from the RootCA and imported in the "Intermediate Certification Authorities" store. If the certificate is in the "Trusted Root Certificate Authorties" there is no message "the connection is not secure". Firefox should import from all certificate stores not only from Trusted Root Certification Authorities. Maybe we can get a option in the about:config to set the certificate store. I want to verify this issue but I need more details about GPO,could you please add all the steps that would be necessary to create a new GPO so I can try and reproduce this issue? We have a development GPO linked to a OU in Active Directory. I edit the GPO and add the certificates: Computer Configuration - Policies - Windows Settings - Security Settings - Public Key Policies - Trusted Root Certification Authorities. Rightclick on "Trusted Root Certification Authorities" choose "Import" - Local Machine - take the certificate. All our enterprise certificates are in the "Intermediate Certification Authorities" but Firefox doesn't import. Thank you for the quick reply, I'm sorry but I have never worked with GPO and I don't know much about it. Is there a program I need to install in order to create a new GPO or how does that work? It would be very helpful if you could provide me with as many details as you can regarding the issue. You need a Active Directory and use the program "Group Policy Management" to create a new GPO. When you open the progam there should be a "Default Domain Policy"
Computer Configuration - Policies - Windows Settings - Security Settings - Public Key Policies - Trusted Root Certification Authorities. Rightclick on "Trusted Root Certification Authorities" choose "Import" - Local Machine - get the certificate. > and I don't know much about it. > many details as you can regarding the issue. You don't need a active directory. Only a certificate which you import in the "Trusted Certification Authorities" Store. But when i test the problem, the certificate don't appears in the certificates (preferences - privacy&security). It seems like firefox not importing the certificates only using the windows certificate store, that would be great, BUT i want define which certificate store. Thanks Christoph, I understand the STR, but unfortunately, we do not have access to our AD and creating or playing around with GPOs is not possible. Even though we cannot reproduce it due to the above reasons, the issue logged makes sense to me, therefore let's assign the proper component and have the specialized people look at it in more detail. Meanwhile, could you please test and report the Nightly Fx63 behavior(https://download.mozilla.org/?product=firefox-nightly-stub&os=win&lang=en-US) related to this issue? If you set the environment variable MOZ_LOG to pipnss:4 and MOZ_LOG_FILE to e.g. %TEMP%/moz.log and run firefox, we might have a better idea of what's going on. > access to our AD and creating or playing around with GPOs is not possible. > have the specialized people look at it in more detail. > stub&os=win&lang=en-US) related to this issue? I will test the Nightly Fx63 version and report this as bug. > * Click "Command Prompt"
The Firefox 63.0a1 has the same problem. I will report this related to the issue too. Hmmm - I guess I misunderstood the issue. Is the problem that your PKI hierarchy involves an intermediate that is both not sent by the server and not imported by Firefox when you enable the enterprise root preference? > not imported by Firefox when you enable the enterprise root preference? I think you are on the right way. I try to explain the problem again. I have set the enterprise root preference to "true". Our PKI enroll the certificates in the "Intermediate Certification Authorities" store. But Firefox not look in this certificate store. When i import the missing certificate via GPO in the "Trusted Root Certification Authorities" store, Firefox using the certificate. The certificate not listed under "Preferences - Privacy & Security - Vie Certificates... - Authorities", but it's working. If i import the missing certificate manually in the "Trusted Root Certification Authorities" store, Firefox using the certificate and will be listed under "Preferences - Privacy & Security - Vie Certificates... - Authorities" and all works fine. Maybe this is a bug, or a security feature? Possible we can get a setting via about:config to set which certificate store Firefox should use? Firefox is expecting the server to include the necessary intermediate certificates, so it only looks for and imports root certificates. I think I'm going to wontfix this for now since this is the intended behavior. I'm going to reopen this because we continue to get this coming up. Is there something simple we can do to resolve this? PLEASE can this be fixed? This issue is holding back Firefox in the enterprise environment and the overlords here are thinking about ripping out Firefox and replacing with Chrome in our image. > certificates, so it only looks for and imports root certificates. Firefox is expecting the wrong behavior. Windows has two different storage locations for root certs and intermediates. Firefox should look at both stores just like other browsers are! Just to be clear, is this the situation? The difference being that in the second scenario, we would need to treat everything in the Intermediate Certification Authorities store as a root CA, while in the first scenario we'd need to pre-load everything in the Intermediate Certification Authorities store as a known certificate. I believe we are caught in scenario 1 BUT the cert is not self signed. Its signed by our internal PKI. 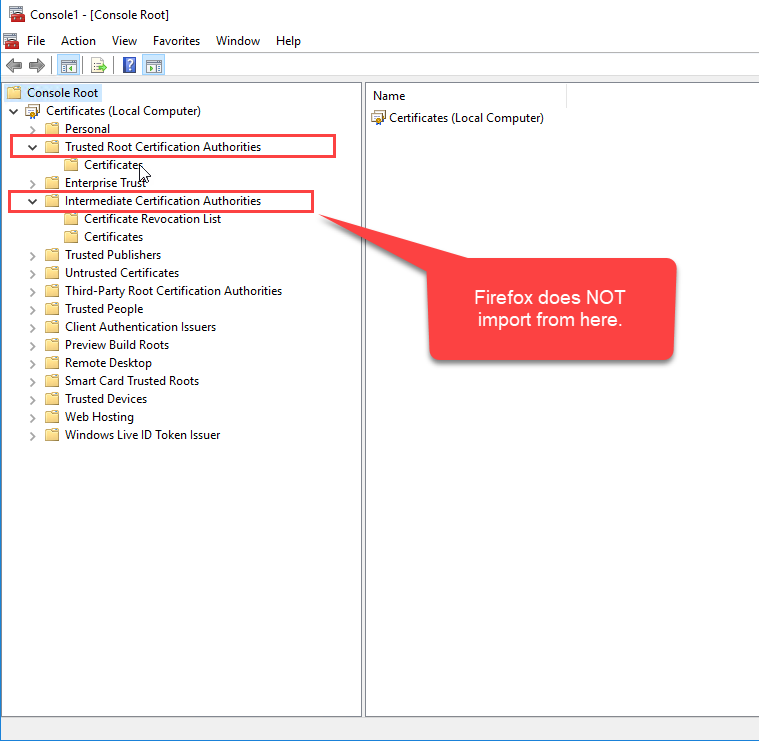 Firefox happily imports root certificates from "Trusted Root Certification Authorities" but NOT "Intermediate Certification Authorities"
Without the intermediate certificate imported Firefox will not load the page. I am a little confused, and I'm afraid it matters to determine which remedy we need to do to enable this case for you. > signed by our internal PKI. Is the "internal PKI" certificate in the Trusted Root Certification Authorities store? > Authorities" but NOT "Intermediate Certification Authorities"
However, if the situation is that you do not have the internal PKI certificate provided in the Windows stores, only the intermediate, and itself only in the Intermediate Certification Authorities store, then the only Firefox-side solution is to rework how the enterprise code functions. Right now it assumes that it is loading root trust anchors, not handling the side-effects of loading intermediates too. Yes our trusted root cert is in the root Windows Trusted Root Store and our intermediate cert is in the Windows Intermediates Store. If I import the intermediate cert into Firefox, everything works fine. Can the same import Firefox applies to the Trusted Root Store be applied to the Intermediates store? This setup works perfectly well in all other major browsers. This isn't a shortcoming in our certificate setup. > not imported by Firefox when you enable the enterprise root preference"
This is a great explanation of the issue my organisation and others are facing. This does work fine in other browsers because they are looking at the intermediates store. OK, in the mean time, if the server provides the intermediate in the handshake, that will solve your problem too. Marking this for the Q1 backlog. item 1 would be to maybe change that to "GatherEnterpriseCertificates"
bits for certificates that are actually self-signed CAs (see also bug 1478826). might be good to rename those instances (e.g. ourselves we're confusing if we don't address that. Did anything happen here? I am trying the GPO on Firefox 65. No change in the issue. No; you'll see this bug get resolved fixed and a version number. I'm afraid we don't have a target date yet, but we're working on one. Feel free to ping me outside the bug if you need more information. handshake, that will solve your problem too. This is complicated enough that I'm going to break it up into Windows first and then MacOS. Is this upliftable to ESR and/or beta? I wouldn't be comfortable with that - there are a number of bugs we would have to uplift as well, and there's already been one regression. Enterprises need to leverage ESR for supportability and maintability. Not being able to centrally manage certificates is a major gap. Frankly this should be table stakes. I'd strongly ask you to reconsider bringing this back to ESR. I just tested FF 67.0b8 in my lab and can confirm that it works correctly, loading the intermediate and root certs from the Windows OS store. I have the enterprise_roots.enable set to true in both a mozilla.cfg file and via the Firefox ADMX file. Both are pushed via GPO.